The autumn of 2018 was a mast year for acorns in the Sierra Nevada foothills. 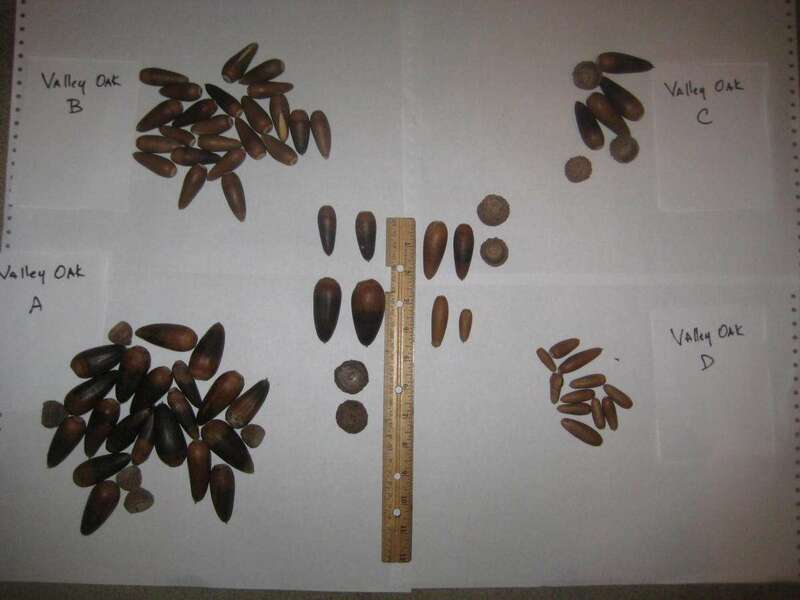 The valley oaks, Quecus lobata, on my property, in Columbia California, produced prodigious quantities of acorns. I had noticed some size variation between the valley oaks located in different parts of the property, and did not think much of it. When I was at the massive house fly invasion job, I noticed that the acorns there were gigantic, far bigger than those at my house. 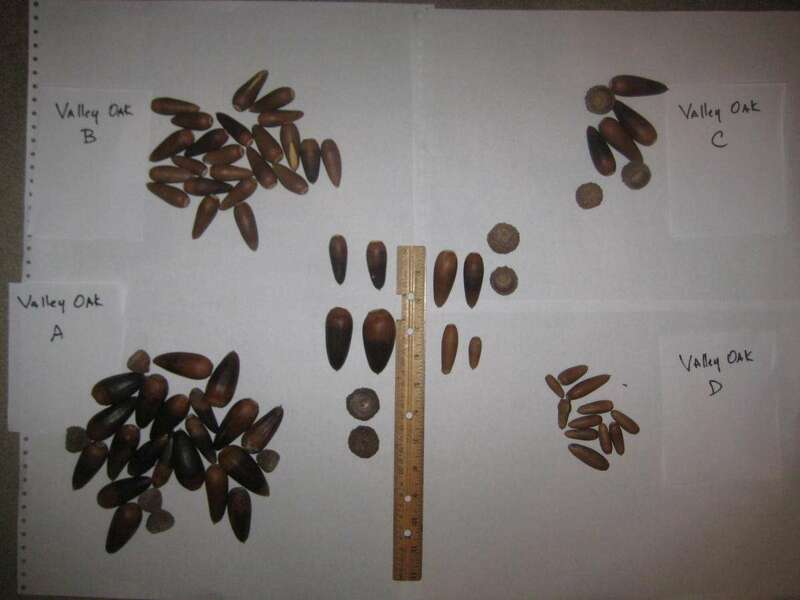 These giant acorns were coming off large valley oaks that grew along a year-round stream. The stream, on a cattle ranch near Chinese Camp, was fed by a spring, and it even had minnows in it, California roach, a fish that can survive in intermittent streams. A couple of the valley oaks on my property grow along a season creek, which had not had water since spring. 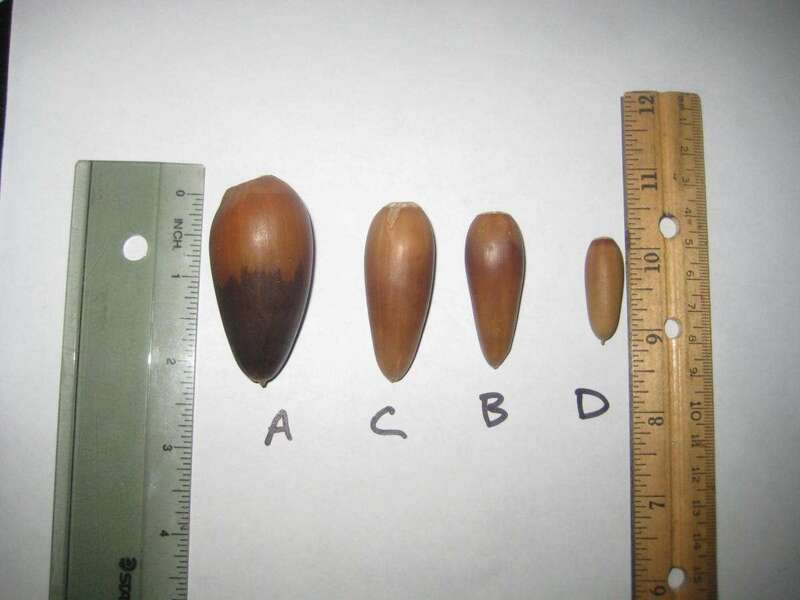 It appears that acorn size may be related, at least in part, to the water available to the tree when the acorns are growing. 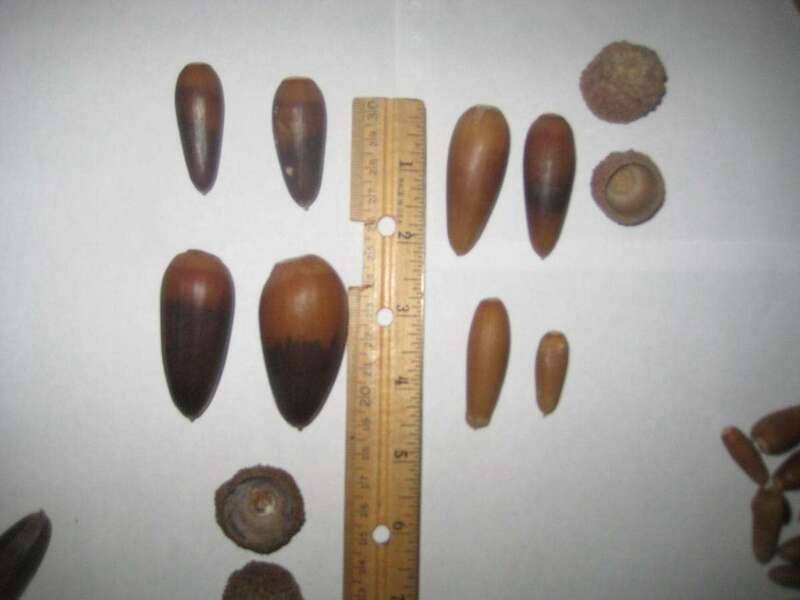 These photos show the remarkable size variation in valley oak acorns. Valley Oak A is from the Chinese Camp trees, fed by a year-round creek. Valley Oak B is from across the street from property, from a huge and old valley oak growing alongside a season creek. The creek had water in the winter and dried up mid-spring. Valley Oak C is from my property, from a somewhat smaller valley oak, and has larger acorns than the largest of my oaks. It is more downhill from “B”. Valley Oak D is from across the street from my house, nowhere near a creek, uphill from the other oaks. IT appears to be the most water starved of the four oaks compared.